ProPulse - A Schieffer Company is proud to be in the running for ISSA's 2016 Innovation Award Program, which recognizes the cleaning industry's most innovative products and services of the year. As the pressure washer hose manufacturer of choice for OEMs, we know that a big issue for all pressure washer hoses is hose management. 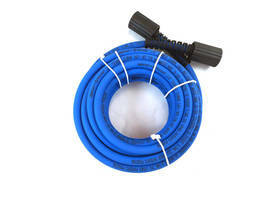 The standard one-wire rubber commercial cleaning hose, is very stiff, heavy in application and susceptible to cracks in the hose cover from ozone attack and exposure to UV rays - much like the cracking and aging of an automobile tire. Once the wire-reinforcement of a rubber hose is exposed, damage is accelerated and premature hose failure is inevitable. UberFlex, in comparison, goes beyond the standard commercial cold water cleaning hose; it's super flexible, reduces user fatigue in commercial applications and it's UV and ozone resistant. It works harder and smarter - providing peak performance, handling and life. Find out more about UberFlex, which is listed in the "Supplies" category, and cast your vote for us by visiting www.issa.com/vote.